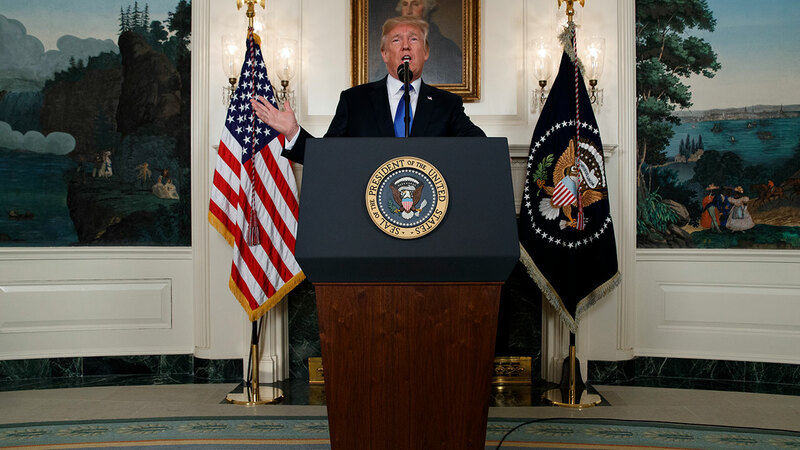 WASHINGTON -- President Donald Trump on Friday angrily accused Iran of violating the spirit of the landmark 2015 nuclear deal, accusing it of a long list of malign behavior and hitting its main military wing with terrorism sanctions. But Trump, breaking with a campaign pledge to rip up the agreement, said he was not yet ready to pull the U.S. out or re-impose nuclear sanctions. Instead, he kicked the issue to Congress and the other parties to the seven-nation accord, telling lawmakers to toughen the law that governs U.S. participation and to fix a series of deficiencies in the agreement. Those include the expiration of several key restrictions under "sunset provisions" that begin to kick in in 2025, he said. Without improvements, he said in a White House speech, "the agreement will be terminated." "It is under continuous review and our participation can be canceled by me as president at any time," he said.